LynchyRightNow: What Can Green Do For You? Down 61-47 with just over seven minutes remaining in the third quarter of their first round playoff game, in the midst of a Dwyane Wade clinic, the Boston Celtics finally woke up. Maybe it was embarrassment, maybe it was old fashion pride, or maybe, just maybe, that final push was a statement. From that seven minute mark onward the Boston Celtics got back to playing defense. The Celtic defense would hold Miami to just 15 points over the final 19 minutes of Game 1, a stretch that watched Boston outscore Miami 38-15. Know this, the trademark of the Celtic defense is holding opponents to under 90 points, a watermark they routinely touched en route to their 2008 NBA Championship. Final score of Game 1, Celtics 85 Heat 76, there is a reason why the Celtics have consistently been amongst the leagues best in team defense over this most recent run. The Heat turned the ball over 19 times on Saturday night, including 7 turnovers from Wade, Miami's lone difference maker. 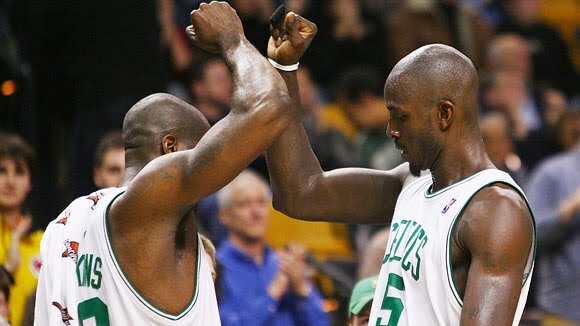 Boston finished with 11 steals including five off the bench from Glen Davis and Tony Allen, (more on them in a moment). If Boston can continue to play this type of defense on Miami and contain Wade as much as possible, the series will be a quick one, they can't afford to let it go on. Not with the Cavs on the horizon. The bench surprised a few, they need to. The Celtics ,as currently constructed, aren't built for long enduring series play. However, if Tony Allen and Glen Davis can continue to put forth games like they did last night, then the Celtics can pump life into the postseason. Now normally I don't condone a night in which Tony Allen shoots more than Ray, but the Celtics don't have many options if Tony doesn't contribute on that second team. The spark off the bench, Tony Allen played in your face defense forcing three turnovers as already noted, but it doesn't stop there. While on the court, Tony Allen is listed as a +17, what that means is that the C's net points while Tony Allen is on the court is seventeen points better than while he's off, eye opening? 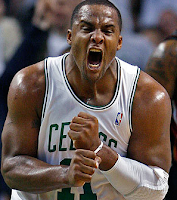 As for Glen Davis, maybe he's just better in the postseason. In 24 minutes, Davis pulled down 7 defensive rebounds, killing Miami's second shot opportunities. Aside from Garnett, the Celtics don't have much when it comes to rebounding, making Glen Davis all the more important during this and every series. Let's not ignore that starting center Kendrick Perkins was useless in Game 1 logging only three rebounds in 25 minutes. Davis can get after it, something Perkins lacks. In Davis and Tony Allen, the Celtics have an answer off the bench, but they can't take nights off. A fighter's chance, yes it's cliche. 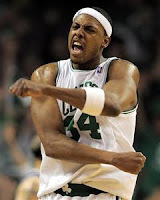 Paul Pierce is a bit of an actor, but we know that. Call that the bad, and call the '08 Finals MVP the good. So if Miami Heat guard Quentin Richardson wants to call Pierce out for his antics, he better be prepared for the backlash. There is a dozen or so players in this league who can put a game on their back and attack the other team, Paul Pierce is one of those players and Quentin Richardson is not. If Kevin Garnett is suspended for a game for his Game 1 antics, you can bet Paul Pierce will put this team on his back. Despite what anyone says, the Celtics are a team that is extremely talented and smart, they have alot to play for and can recover from a suspension or an injury, you saw that in their first round performance against Chicago last season, down Garnett. Looking back on Game 1, it was Pierce's second half that sparked the Celtics, the scuffle, the ejection, the game was already decided at that point, so it didn't propel Boston to anything. However, if this series is going to be decided by anyone, it'll be the Celtics and Pierce, a team looking to make a statement. With rumours whirling about Doc Rivers departure at the end of the season, Allen's free agency looming, the Celtics last run is staring us right in the face. After watching Game 1, they aren't going out without a fight.